Who Are Adjustable Gastric Band Candidates? Approved by the FDA in 2001, the adjustable gastric band is the safest, least invasive and only adjustable surgical treatment for morbid obesity in the United States. It induces weight loss by reducing the capacity of the stomach, which restricts the amount of food that can be consumed. Since its clinical introduction in 1993, almost 150,000 procedures using the adjustable gastric band have been performed around the world and more than 30,000 in the United States alone. During the procedure, surgeons usually use laparoscopic techniques, making small incisions with long-shafted instruments to implant an inflatable silicone band into the patient's abdomen. Like a wristwatch, the band is fastened around the upper stomach to create a new, tiny stomach pouch that limits and controls the amount of food you can eat. It also creates a small outlet that slows the emptying process into the stomach and the intestines. As a result, patients experience an earlier sensation of fullness and are satisfied with smaller amounts of food — which leads to weight loss. Since there is no cutting, stapling or stomach re-routing involved in the adjustable gastric band procedure, it is considered the safest and least traumatic weight loss surgery. The laparoscopic approach to the surgery also offers the advantages of reduced postoperative pain, a shortened hospital stay and quicker recovery. 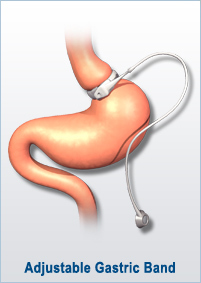 If necessary, the adjustable gastric band is also removable. The adjustable gastric band is also the only adjustable weight loss surgery. The diameter of the band is adjustable for a customized weight loss rate. Your individual needs can change as you lose weight. For example, pregnant patients can have their band deflated to accommodate nutrition for a growing fetus, while patients who aren't experiencing significant weight loss can have their bands tightened. The major benefit of adjustable gastric band surgery is that it does not involve cutting the stomach, stapling the stomach or adjusting the digestive anatomy. It is completely reversible and requires less than a 48-hour hospital stay. The goal is to lose .5 to 1 pound per week. After two years, the goal is to lose 50 to 60 percent of excess body weight. First post-op follow-up appointment is two weeks after surgery. First assessment for adjustment is at week six. The patient will be reassessed for adjustment every six weeks until the six-month appointment; and then every three to six months. Keep a weekly weight diary to show your doctor at every follow-up appointment.